LATimes: The paranoid central conundrum of "The Crazies," which recurs in the most suggestive disease movies, can be traced back to Don Siegel's 1956 sci-fi classic "Invasion of the Body Snatchers": How can you tell who's infected? (And how do you keep from getting infected?) 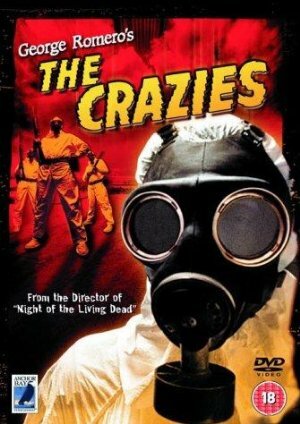 In "The Crazies," the action alternates between a scientist (Richard France) scrambling to develop an antidote and a ragtag band of holdouts, led by a fireman (W.G. McMillan) and his pregnant girlfriend (Lane Carroll). But mistrust and fear soon set in among the survivors. The sense of community that typically emerges in a disaster movie is dramatically undermined when the disaster in question is a contagious virus. Romero's best movies are often discussed in terms of their respective zeitgeists -- "Night of the Living Dead" as an allegory of late-'60s sociopolitical upheaval, the mall-set "Dawn of the Dead" (1978) as a critique of the ascendant consumer culture. No less than these films, "The Crazies" is a product of its disillusioned moment. But this time capsule of the Vietnam/Nixon years feels as timely as ever today, not least because of Romero's deep skepticism of authority and his pessimistic view of human nature in extreme situations. Ambiguous to the end, "The Crazies" doesn't distinguish between the madness induced by infection and the mass hysteria caused by martial law and the military's shoot-to-kill measures. As in so many Romero movies, the most alarming thing here is the fine line between sanctioned and deviant behavior, between Us and Them. Deep Focus Review: Regardless of his success on Night of the Living Dead five years earlier, Romero was no more prosperous financially, except perhaps for the notoriety of releasing a hit cultural phenomenon. His budget for The Crazies was a mere $270,000, which is reasonably extended given the scope of the picture. Shooting in Evans City, Pennsylvania, Romero relied on volunteer extras to play the frenzied masses, including high school teenagers as the gas masked government goons. He got lucky when the local firefighters set an old abandoned farmhouse on fire for practice; the director shot needed scenes around the burning building, otherwise such pyrotechnics were outside of his resources. These innovations are crucial in low-budget filmmaking, and Romero is a master of stretching a meager budget. With the exception of Land of the Dead, each Romero film has boasted minor financing yet contains a striking visual style, both in terms of composition and the special FX details that appear onscreen. Furthermore, Romero’s editing mixes up the C-grade production value, rendering it in a frenetic pace. His cutting may be the foremost reason to seek out this film, particularly in a staccato scene that snaps back and forth between brainstorming military officials and the execution of their preparations. The cheap film shock and palpably economical production have less presence during a viewing because Romero, aside from being a master of horror, is also a master of disguising his limitations through his ingenuity as an editor. Even if Romero steals from himself to come up with his plot and themes for The Crazies, the film deserves its place as a cult classic on a purely cinematic level. I will have more to say soon, but, man, that guy in the PR situation room looks like Trump. I'd seen the remake, which is brutal, but basically zombies. This, while not a well shot film, was completely different. This seemed to be even more about Bad Government Vs Crazy Gun Nuts that I would have ever guessed. I'd been meaning to watch this since I saw the remake, so, thanks for posting this. I actually liked the remake, but my recollection of it also is that it was much more of a straight up zombie flick, which is kind of too bad, because it could have been all of the things that Romero's original wasn't (well-paced, suspenseful, coherent, well-acted, well-scored, the list of weak points in the 1973 original goes on and on), yet it could also have been all of the things that the original was (inventive, especially in the way that there seemed to be no meaningful difference between the 'crazies' and the government).